Ramana Maharshi was born to a Tamil-speaking Brahmin farming family. At a young age Ramana was largely disinterested in school and absent-minded during work. But he had a marked inclination towards introspection and self-analysis. He was always seeking to find the answer to the mystery of his own identity and origins. 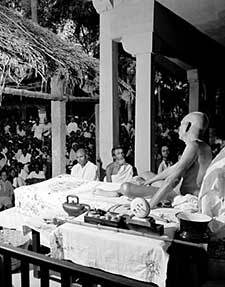 In the summer of 1896, Ramana went into an altered state of consciousness which had a profound effect on him. He experienced what he understood to be his own death. 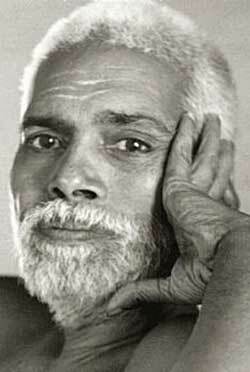 Sri Ramana wrote of his awakening: “It was the summer of 1896, about 6 weeks before I left Madurai for good (to go to Tiruvannamalai – Arunachala) that this great change in my life took place. I was sitting alone in a room on the first floor of my uncle’s house. I seldom had any sickness, and on that day there was nothing wrong with my health, but a sudden violent fear of death overtook me. There was nothing in my state of health to account for it nor was there any urge in me to find out whether there was any account for the fear. I just felt I was going to die and began thinking what to do about it. It did not occur to me to consult a doctor or any elders or friends. I felt I had to solve the problem myself then and there. With this glimpse of a higher, immortal consciousness the Maharshi lost all interest in his worldly life, he was plunged into a period of intense meditation on the nature of “Who am I”. Absorbed in contemplations of a higher consciousness, Ramana no longer felt any reason to stay in his home town. Instead he was magnetically drawn to the holy mountain of Arunachala, considered sacred by Hindus, and lived there for the rest of his life. 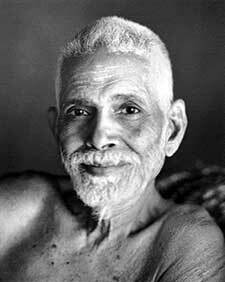 01 Ramana Maharshi – The Sage of Arunachala from Papaji on Vimeo. 5. Sri Ramanasramam: Bhagavan Ramana, by T. M. P. Mahadevan, M. A., Ph.D.